Professor Wendy Nelson studies marine algae and her work is primarily focused on discovery and documenting the New Zealand flora. She currently has a number of research projects underway on diverse groups of seaweeds. 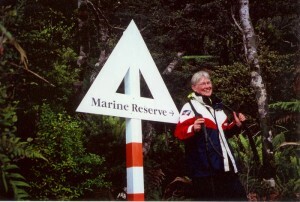 Her research includes systematics, biogeography, ecology and life histories. She studied at the University of Auckland, Victoria University and the University of British Columbia with a background in both botany and marine science. Wendy works at NIWA as a programme leader in marine biological resources (particularly marine biodiversity) and also as a member of the Joint Graduate School in Coastal and Marine Science at the University of Auckland, in the School of Biological Sciences. Wendy says her love of all things marine stems from a childhood spent on beaches from Dunedin to Northland. The Three Kings Islands have a unique seaweed flora – and Roberta and I will be focusing on getting collections that will help us answer various research questions. My previous visit to the Three Kings resulted in a number of discoveries of new species so I am excited by the opportunity to get additional material and make new discoveries. As far as the macroalgae, I am an experienced phycologist with a wide knowledge of the NZ flora and together with expedition member Roberta – who is an expert diver and phycologist – we are focusing on detailed sampling and processing of material. My daily work is a mixture of lab, field and desk studies – investigating different aspects of NZ seaweeds.